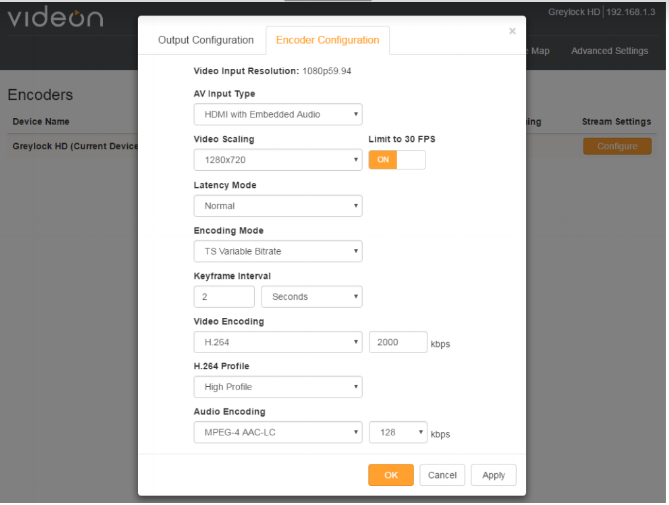 How do I stream using Videon Empire HD or Greylock HD? 1. Log in to your DaCast account and navigate to “Preferences” –> “API”. Copy this key value as you will need this for later. 3. Go to your Greylock’s web user interface and click on “Encoder Control” and then the “Configure” button. 5. Enter the value you were provided at step 2 into the “API Key” field. 6. Click the “Get Channels” button for the encoder to retrieve all channels that are available on your DaCast account. 7. From the “Channel List” dropdown, select the channel you would like to stream to. 8. Toggle the RTMP Output switch to ON. 9. Switch to the “Encoder Configuration” tab and ensure the encoder configuration values are correct, especially the keyframe interval = 2. 10. Click “Apply” and then “OK” to begin streaming. 11. 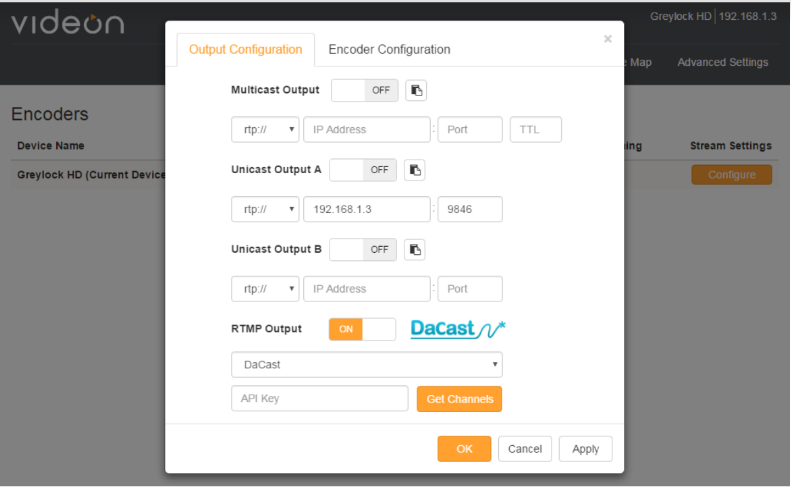 To view the stream on your DaCast account, go back on the DaCast platform –> “Publish Settings” of the channel you are streaming to. Then click on the button. Please note that it may take up to 30 seconds for the stream to be viewable. 2. Open a new tab and enter your encoder’s IP address to open the web User Interface. 4. Under Firmware Update, select Choose File. Use the browser to select the file you just downloaded in step 1. 5. Select Upload & Install, then confirm that you want to install new firmware.